Regularly cleaning your windows and facades creates a fresh, tidy and representative appearance for your organisation. 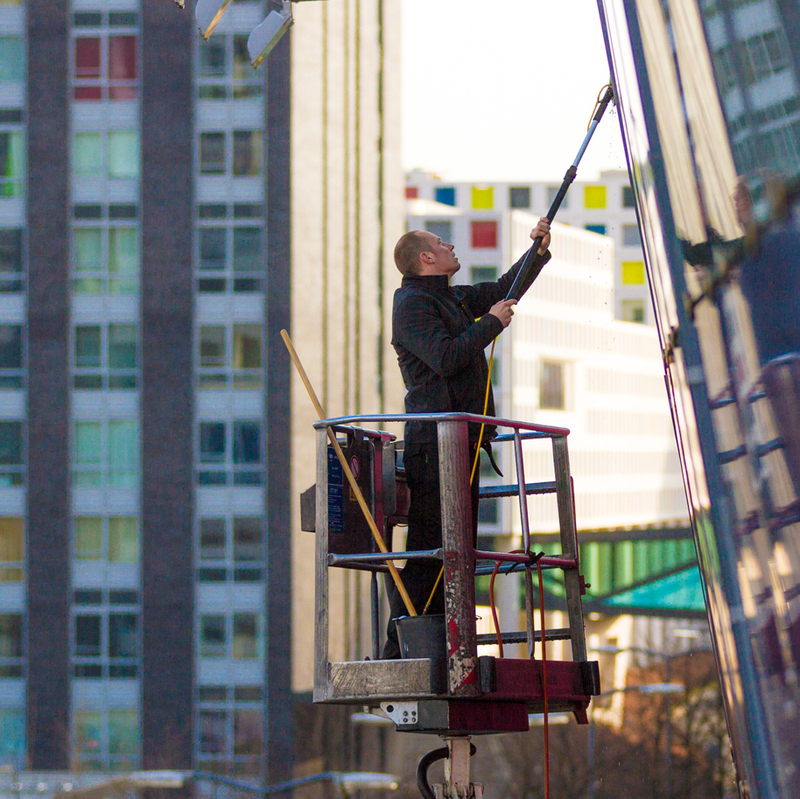 Degenaar Gevelonderhoud offers full-service cleaning, maintenance and protection of windows and window frames of office buildings, commercial properties, shopping centres and (government) institutions. We work in a result-oriented manner, and have only one goal: optimally washed and shining windows, both inside and outside. A well maintained building with clean windows is your calling card, after all. Clean windows also let in more light, which creates a more pleasant working environment for your employees. But did you know that with proper maintenance, you can extend the lifespan of your window constructions and postpone paintwork by one to three years? When the working height does not exceed 7 metres, we still use the traditional standing ladder to clean windows and window frames every day. Up to a working height of 13.5 metres, we can also use a Telewash system. The main advantage is that it takes up a lot less room than a hydraulic platform, can be used on all types of ground surfaces, and costs less. However, the system has limited applicability because of the physical nature of the work, and according to the health and safety regulations we can only use it in cases where no other options are available. There is also a maximum of 200 m2 (2,150 ft2) per project that may be cleaned with this system. High off the ground, we almost always use the facilities available on the building or facade. If necessary, we work from the ground using a hydraulic platform. Degenaar Gevelonderhoud owns various types of hydraulic platforms. They are all characterized by a low weight, which is a significant advantage on soft ground and vulnerable surfaces. The maximum working height of a hydraulic platform is 36 metres (118 ft). We also have a platform with a working height of around 18 metres (60 ft) that can fit through a standard door. Ideal for inside work such as atriums. Our staff are trained to work with the most common permanent facade installations. We typically work under contract, but incidental assignments are also an option. We have all the knowledge and experience to help you make a multi-year maintenance plan (MYMP). This can include both periodic window cleaning and maintenance of other facade sections. Think, for instance, of cleaning and preserving window constructions, or cleaning your facade and making it moisture-repellent. A structurally maintained facade can save you a significant amount of money. Working off the ground means safety first, and all the safety regulations will be heeded. Our employees are all trained to do this. We are VCA-certified and have completed the SVS window cleaner training. For each building, we assess the working method(s) and determine which safety precautions must be taken. Naturally, all our work is carried out in compliance with health and safety regulations. We also make sure all our materials meet required standards and are inspected every year. Would you like more information, or a quote for building maintenance? If so, please contact one of our employees. They would love to help you.